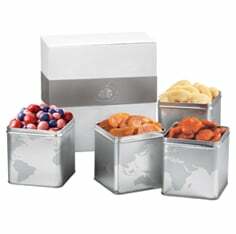 The Premium 4-Tin Boxed Gift Set from Meduri World Delights features: luscious Harvest Pride® Peaches, exquisite Sweetglow® apricots, juicy, and sweet-tart Double Red grapefruit slices and exceptional Double-Dipped Chocolate Covered Fruit Mix. 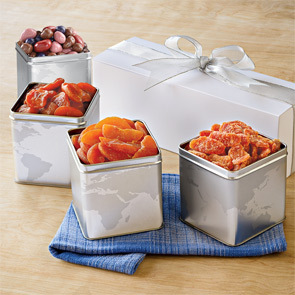 Combined, this all-natural dried fruit creates an enticing gift with tastes that are irresistible anytime of year. 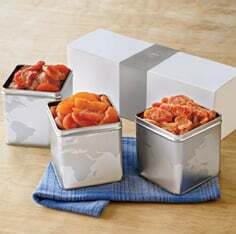 12 ounce tins, elegantly gift-boxed. 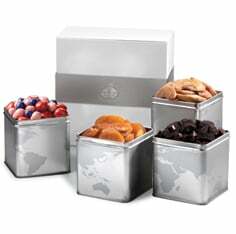 Shop the entire collection of chocolate gift sets at Meduri World Delights.